A Small Island in the Balearic Sea. While pouring ressources into commercialising its Balearic sisters, Mallorca and Ibiza, Franco plainly neglected Menorca in the ’50s and ’60s, which, combined with the fact that it was declared a Unesco Biosphere Reserve in the ’90s, has preserved it as a serene, rural paradise attracting the kind of people who love good quality simple living. While there are no highrises, very few tacky tourist traps and only a single highway on the island, it’s brimming with delicious local produce and artisanal goods, hip boutique hotels and gourmet eateries set amidst quaint, well-kept whitewashed villages and rich and rugged natural beauty. What first opened our eyes to this paradise and made us book the trip after planning to attend a wedding in Barcelona, was this article in SUITCASE, sent to us by our friend and editor of HYHOI, who once spent a summer windsurfing off the coast of Fornells, in the north of the island, where her parents also own some land. 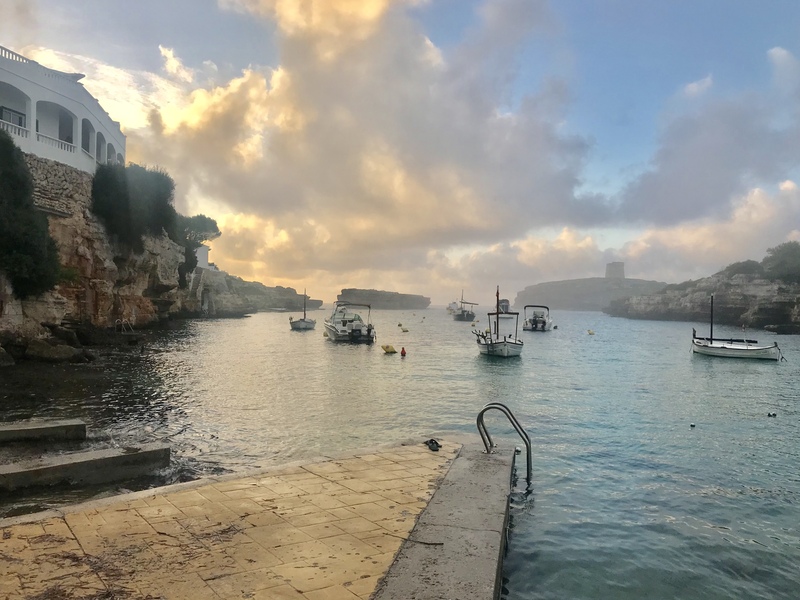 Forbes’ Top 5 Reasons To Visit Menorca (And Why You’ll Love It More Than Mallorca and Ibiza) as well as Times’ Take It Real Slow in Unspoilt Menorca, served as additional alluring advocates. As such, armed with Google maps stars for goodies tried and tested by Nina as well as by our friend Lara, editor of Hola Foodie, we boarded the 30-minute or so flight from Barcelona for five days of pure bliss. Our Impressions. Balmy 22-27 degrees, mildest of mild autumn vibes, sunshine for the most part, one day with light rain. Sun-bleached villages everywhere we go – pretty villas and stately farms. The plazas and narrow, winding streets are vibrant in the morning and evening, with people sitting outside their houses, chatting, laughing, sipping coffee and wine in the sun, nodding at passers-by – and dead-silent during the siesta hours. Rolling hills, rugged coastal topography, virgin beaches. Proud traditions – biodynamic food and wine, luminous art, characteristic shoe and clothing design and manufacturing. Charm. Friendly faces. Tourism concentrated in small enclaves in the coastal towns – easy to avoid (but this is also off-season). That characteristic dry, fragrant smell of Spain, even if the humidity is higher here than on the mainland. It’s pine and chamomile, the smell. We buy bags of dried chamomile to use for tea. Hiking along roads less travelled for some sweeping rocky landscape views, some pristine sand, some crystal clear water, some ‘hola, buen día’ exchanged with cheerful residents and some exquisite local 🍅🌶🍞🐟☕️🍷🎨🎶. In the always energising and calming company of Sanoop. Menorca, with your idyllic coves everywhere we turned (80 in total!) – you made us stop and stare and beam at each other for several seconds … before taking a trillion photos, incl. snaps of all of the real estate agents’ seaside villa listings, and running like carefree kids down to jump in the warm water. An island that’s small and easy to navigate – yet sufficiently big and versatile for us to want to go back and experience more. First Evening – our Airbnb cottage. The fabled serene silence hits us as soon as we touch down, just a few miles inland from the dramatically rocky south-facing shores. Fetching our rental car, we make a quick stop in Sant Climent, our first encounter with one of those snow white villages dotting the island, to do some light shopping in an impressively well-assorted though tiny and unassuming grocery store – we pick up tubs of aioli, hummus and almond-based yoghurt, a loaf of freshly baked sourdough bread, Spanish avocados and pears, anchovies in olive oil, olives, a litre of gazpacho pre-made from all-natural ingredients, big bottles of water – before heading towards our home in the small seaside village of Alcaufar, located a mere 7 min drive from the airport and 2 min walk from the sea. Set in a small, neat garden with a giant pine in front of the porch, the small cottage is adorable – white (obviously), cosy and clean. The hostess greets us warmly – showing us around the small, charming rooms and the rooftop terrace and pointing out the yummy local delicacies she’s left in the fridge for us – before leaving us to a quiet evening, the first time we’re alone in 5 days. After enjoying a light, late dinner, we head up on the roof to watch the stars – twinkling a lot clearer here than in Barcelona or Singapore. This is a great spot – we figured it would be a nice point of departure for exploring the island; small quaint seaside village close to the airport and largest town on the island, Mahón, but, well, on the same time, it doesn’t take more than 45 minutes to drive to the opposite end of the island, and perhaps we’ll find a favourite spot somewhere entirely different to stay next time we visit, but for now, on this first night in town, it seems pretty good for a holiday home. Morning walk, yoga, standing still and soaking in the atmosphere in Cala d’Alcaufar, which reminds me of something out of a The ‘Fives’ Book – the cosy cottages along sloping streets leading down to the water, the rough stone paving hugging the coast below the cliffs, the rustling sound and salty smell of the soft waves hitting land, the wooden fishing boats, the magical stillness, the magical early sunlight… ahhh. Adventurous little hike through the shrubbery from ‘our’ cala to Caló Roig, where we walk into the water for a refreshing dip – followed by an adventurous drive along the coast to all of the beautiful calas we hit like pearls on a string along the coast: Cala Torret, Cala Binibèquer, Binibeca, Caló Blanc, Cala de Binidalí, the latter of which has a stunning outlook point, Mirador de Cala de Binidalí (next time we get to this part of the world, I want to check out Cova d’en Xoroi). Head back to Ciutadella for some tasty seafood at S’Amarador on the marina. Even driving down to the most heralded beaches on the island, Cala en Turqueta, Cala Macarella and Cala Macarelleta, is a quiet, solitary ride along very narrow, very bumpy rural paths, featuring no roadside advertising or tourist shops. We swim – and do headstands, haha. Lovely! Visiting small inland villages with a very local feel; still charming, full of kids playing on playgrounds and adults taking their time reading the newspaper at alfresco cafes, but just a bit more … low-key, everyday-like, less ornate and manicured than the coastal towns: Ferreries and Es Mercadel. Another delightful seafood dinner – this time at Es Molí de Foc in Sant Climent. We drive far along one single unpaved country road to get to a hiking trail zigzagging through a vast hilly, rugged, windswept expanse of ochre-coloured soil and cliffs and low-lying fragrant shrubbery – leading us to a glorious sight: sculptural rock formations, bright red sand and luminous shades of blue. Cala Pregonda. We spend a good 3-4 hours reading, meditating and gazing at the natural colour palette of northern Menorca from this spot. Swimming in the clean, clean water. Head back to the car when we get hungry – quick and cheerful picnic of avocado, quinoa crackers and overly ripe peaches. Misty-transitioning-to-clear morning light in our tranquil cove at the easternmost tip of Spain. Sunlight creeping up across the rocks. Sun salutations have never seemed like a more appropriate outdoor morning exercise, haha. Delightful breakfast and cortado con leche de avena at Pipet & Co on a beautiful plaza just off the port in Mahón – good morning music, clear sunshine and the smell of toasted sourdough bread, garlic and freshly ground coffee filling the balmy air… mmm! This is the October edition of Sanoop’s 2017 Christmas gift, a monthly breakfast in a place we haven’t been to before, which has had us enjoy our morning coffee in Venice, Melbourne, Sydney, Ubud, Juelsminde, various neighbourhoods of Singapore – and now Mahón! Lunch back in Mahón, at a hippie happy vegan place. Sharing a vegan brownie for dessert, sitting across a stone wall on the edge of the cliff overlooking the port and taking in the sweeping views before our late-afternoon departure. ¡la realidad es mejor que nuestros sueños y nuestra imaginación! Barcelona. Friday night and Saturday morning back in the city. Late night paella on the beach with friends followed by cocktails at some hip boutique hotel. Morning run around Exiample. Browsing through the Sant Antoni Market, enjoying the sensory impressions of the fresh produce and the locals enjoying their morning cortado by the stalls. Getting our own cortado fix at Morrow before heading out on a little walking tour of Gaudí’s most iconic works to wrap up our Spain-trip. 3:30pm flight to Singapore.